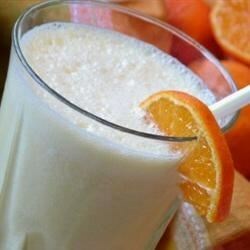 "Frozen orange beverage that tastes just like the one in the mall! You have got to try it! This can be frozen and enjoyed as an Italian ice as well!" I have been making these since I was a kid. The only difference is that I use 1/3 a cup sugar. Yummy!! This was okay the first time, but the 2nd time I made it I added 1 t. powdered egg white, and it was much better, a lot thicker and creamer. Good, but a little sweet. Next time I'll cut the sugar in half. This stuff is terrific!! However, half a cup of sugar makes it a little too sweet (for my taste), so I never use quite that much. Wonderful recipe and very, very tasty.